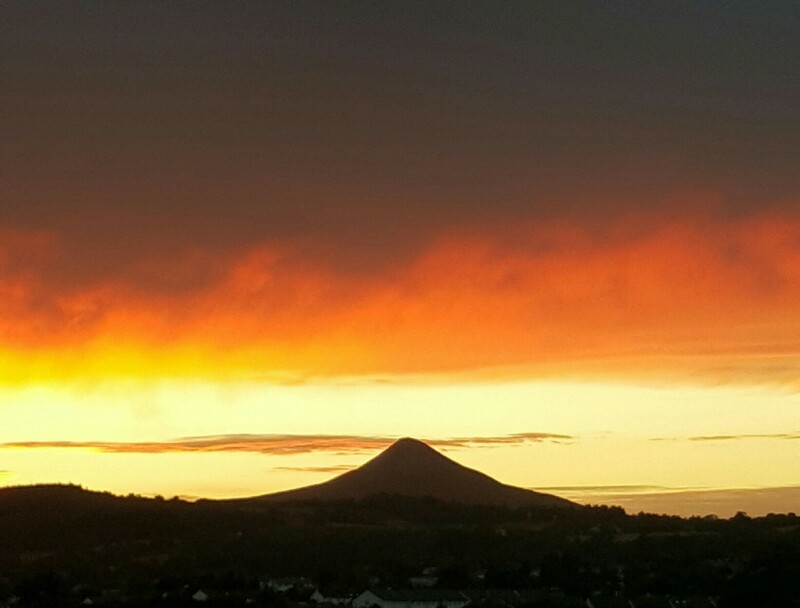 Last night the sky was a fiery red over sugarloaf. This morning the colour is faded to a pale pink. The swallows, having successfully nested and reared their young between the iron girders of the balconies below mine, are already up and chasing flies across the sky. I am grateful that my neighbours either don’t notice the nests (and the swooping birds) or are lovers of swallows too. It would only take one self righteous occupant of these fairly new apartments, to alert the Health and safety department . It would most likely be someone who didn’t use their balcony. Someone who didn’t plant runner beans and grow bamboos on them. Someone who didn’t store their bicycle there. Someone who didn’t stand there in the evenings to watch the sun drop behind sugarloaf or the grey clouds form a lacey shawl around her shoulders. Someone who didn’t even realise that there are swallows nesting there until their attention was drawn to them. So though we may ALL be on the side of the swallows (I suspect we are but daren’t risk finding out) the subject is taboo. For the birds safety best turn a blind eye to them. Get them nested, mated, fledged and flown without the fanfare they deserve. When we meet in passing, we speak about the weather and the increased traffic and how the little man I had rescued (I found him clinging to a lamp post in the storm, hanging on for dear life, afraid to let go for fear he would be bowled by the wind across the carpark) has got over his fright and is doing well. Yes, we talk about everything but the swallows. The elderly and very dapper gentlemen who lives below me and has the greatest number nesting on his balcony, holds the door open for me gallantly. ‘How was your work day?’ He asks, a swallow skimming the top of his white thinning hair. ‘Busy’ I sigh, as though it was the wind that causes it and his moustache to ruffle. ‘Feet up and a nice glass of wine so’ he smiles as a second swallow poops just missing his ear. ‘How did you know that is exactly what I need’ I smile, pretending not to notice him brushing something off his sleeve. ‘I saw you clapping your hands at the magpies again this morning’ My neighbour across from me states, staring at me intensely. She is seventy five and is studying chinese and history and I feel would be very amenable to the swallows. I open my mouth to explain that I am sick of them attacking the swallows nests but, though she is already smiling and nodding in encouragement, I stall at the last moment and mutter something along the lines of performing some sort of tai chi on my balcony every morning that involves clapping. No! we don’t trust each other when it comes to the swallows safety. One word to the wrong person would be their downfall and we cannot imagine a summer morning without their magical presence. I imagine if they were got rid of a lot of us would leave too. And I am sorry to be leaving before them. I feel guilty, for as my neighbour has noticed, who else but the mad woman that I am, will step out on the balcony in the early hours clapping her hands wildly to chase away the marauding magpies from their nests, when the small finch, who keeps constant watch from the nearby hawthorn tree, sounds the alarm. Hopefully she will take over but I daren’t ask her. Instead I have told her the exact day I am going hoping she will get the message. I think she has for she nodded furiously and told me she would come out every morning and make sure the magpies were not attacking my RUNNER BEANS. We smile at each other for a long time. The reason I am going is, my much dreamed about sojourn to Brittany is looming. My panniers are out and waiting to be packed. The last time I made such a journey to france was six years ago when I had just finished my interferon treatment. Back then I had flown with the yellow bicycle to Bordeaux to cycle from the Atlantic to the mediterranean. This time will be different. A slower getting there. This time my journey will begin when I wheel the yellow bicycle out of my home and cycle down the road to the train station and haul it up the steps and over the tracks to platform two and catch the 10.30 train to the port of Rosslare. One of the loveliest train journeys in Ireland I am told. The boat journey from rosslare to roscoff takes 16 hours and in celebration of my 60th birthday in November I have booked myself a cabin. Not just any old cabin, but a cabin on the 8th deck with a window looking out at the sea. A cabin that promises a complimentary bar and bowel of fruit. More used to wild camping than such luxury, I pressed the key on my laptop nervously. Then spotting a small island just 15 minutes by boat off the coast of Brittany(coming from an island and loving all things islandy I suppose it is only natural to be drawn to another one) I found myself once again pressing the key. I now had a little house to stay in on a little island. ‘Oh I can get the boat back to the mainland every day and do some cycling on the greenways’ I explained defensively to my sister, anxious she wouldn’t see me as opting out of my original plan of cycling across Brittany. I am adding my laptop, drawing materials and paints to the bundle by my panniers. 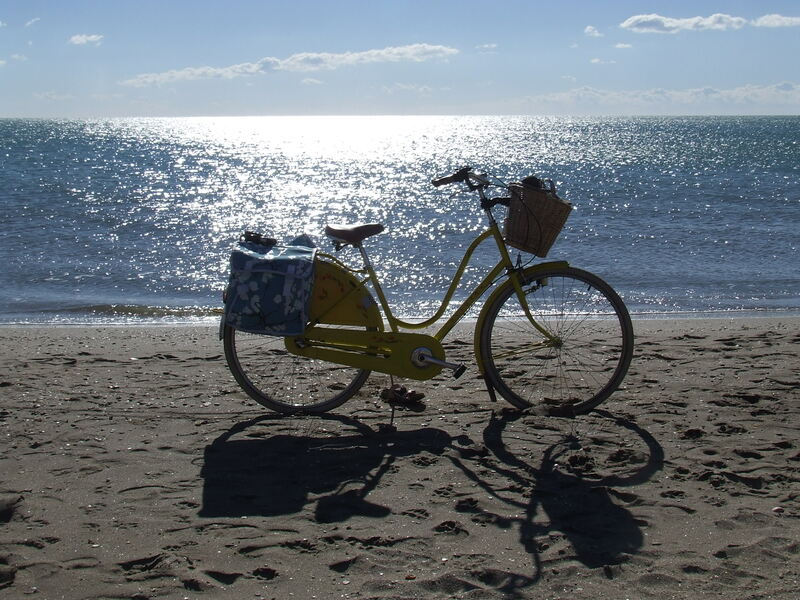 The yellow bicycle resting at her journey’s end (The mediterranean) the last time we were in france.